Find out your Secretor Status! It is incomprehensible to me that November is here already. I don’t know if anyone else is feeling this way, but it seems that the speed of life has really escalated. I have to believe that some of this is due to the non-stop bombardment of information about all the news and events that are happening around the world. Natural disasters, horrific events, and turbulent politics smatter the mainstream media. But hidden amidst these tragedies are hidden gems of beauty and hope, from acts of courage, compassion, kindness and bravery to sobering moments of togetherness. Our November tradition has been to have a month of thanks and gratitude, rather than limiting it to one day sitting around the table with family and friends. Isn’t it a novel and compelling idea to claim the entire month as an exercise in gratitude? Cultivating and increasing our awareness that every day, we have an opportunity to give thanks, to share with others our appreciation of them and to quite possibility do something that makes a difference in another’s life, no matter how big or small that difference is. Join us in a month long celebration of expressing gratitude and giving thanks. And on behalf of Peter, myself and all of the D’Adamo Personalized Nutrition staff, we thank you for your dedication and commitment to well-being. We are constantly grateful to be a part of your journey to greater health. When Dr. Peter D’Adamo wrote Eat Right 4 Your Type in 1996, it was only the beginning of his exploration into how your blood type can affect your health. The book featured detailed explanations of how food lectins could have different reactions in different people and gave readers all the information they needed to live a healthier life through personalized nutrition. Four years after the broad, sweeping success that was Eat Right 4 Your Type, Dr. D’Adamo followed up his best-seller with Live Right 4 Your Type. While Eat Right 4 Your Type is the star of Dr. D’Adamo’s book series because of its accessibility and the fact that it builds the foundation for many of his other books, Live Right 4 Your Type is an incredibly important addition for people looking to optimize their journey on the Blood Type Diet. It takes the personalization of the original book even further by introducing and explaining secretor status. Our friend Eric Morrison of the YouTube page 4Course summarizes the concept clearly and with great detail in this video. The important thing to remember about secretor status is that it can have a great impact on your success with the Blood Type Diet, even if you are already doing quite well. As Eric mentions in the video, secretors and non-secretors can have different food values; sometimes even for staple foods. These sorts of differences in foundational foods can change the entire way you structure your diet. Each blood type is affected differently by secretor status, and there are a collection of foods that have their values adjusted based on it. You very well could be avoiding foods you are allowed to eat or be eating something that is harmful to you without even knowing it. Finding out your secretor status takes the guesswork out of these diet decisions and further personalizes your already individualized plan. Even though only 20% of the population is non-secretor, the changes in your appropriate Blood Type Diet could be significant if you are one of them. If you don’t know your secretor status yet, we offer a Secretor Status Collection Kit that you can use to send a saliva sample to a lab for testing. In just 21 business days, receive your results and start adjusting your diet accordingly. We suggest the secretor kit for everyone so they can have a more complete view of their personal needs, but especially for those with illnesses, constant fatigue, inflammation or other persistent issues. Despite your healthy lifestyle choices, the answers to problems that linger could lie in your secretor status. "It all begins to make sense, and my health is improving, and I FEEL so much better! To have so much more information about my body and how it works is awesome!" - review by Jessica D.
The Blood Type Diet is something I found out about many years ago. I discovered the diet, like most, through Eat Right 4 Your Type and was inspired to put Dr. Peter D’Adamo’s words into action. I followed my Blood Type O diet plan to great success, but didn’t have the willpower at the time to stay compliant. I started to stray from the plan and avoids began to wriggle their way back into my diet. Gluten, wheat, dairy, white sugar, white flour and potatoes all became part of my lifestyle again, but these poor decisions didn’t take long to manifest themselves as health problems. This is the moment when I realized that not only did the Blood Type Diet make me feel better when I was compliant, but neglecting it literally made my body suffer. I decided not to let my guard down again, and recommitted to the BTD lifestyle. During my time away from the diet, I also discovered the importance of secretor status. I took the test when I first started but never got serious about adding the adjustments to my diet. So, when I decided to re-immerse myself in the diet I included the adjustments required because I am a non-secretor. With this extra knowledge I have been able to weed out even more foods that aren’t good for me. I wouldn’t have known about these foods without taking the Secretor Status test, and eliminating them has made me feel even better than before. As someone turning 64 this year, I feel immensely grateful for Dr. D’Adamo’s life-changing work. I hope that my story can help inspire people who read it to take that first step. I want my story to be an encouragement for all so that people can get on board and experience the noticeable changes that happen just within the first few weeks of compliance. Once you start and feel the difference, you’ll never want to go back! Dr. Tara Nayak, a close friend and protégé of Dr. D’Adamo himself, was recently featured on Ladyfox Entertainment’s “Nothing Off Limits” podcast where she discussed the Blood Type Diet, Epigenetics, and generative medicine. Dr. D’Adamo spoke at the Hershey Lodge and Convention Center on Friday, October 20th for the Pennsylvania Association of Naturopathic Physician’s ninth annual professional conference. The seminar was focused on how to integrate Naturopathic Medicine with conventional care methods. Awakening from Alzheimer’s sent an email blast to their followers as part of their new “Brain Health Breakthroughs” series that talked about how blood type impacts mental health, citing research from University of Vermont professor Dr. Mary Cushman and Associate Professor Dr. Lu Qi from the Harvard School of Public Health. The name Cauliflower comes from the Latin caulis (stalk) and floris (flower). It is a cruciferous vegetable that grows in three different colors, white, purple and green. It is high in vitamin C and has a fair source of iron. 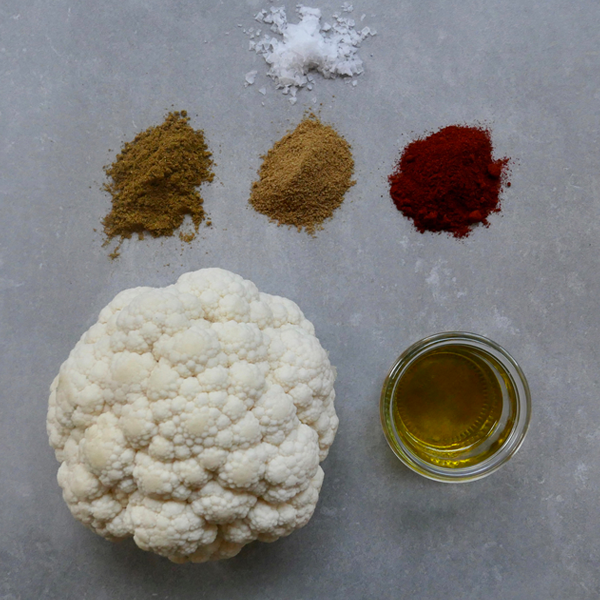 Eaten around the world, cauliflower has a very subtle flavor, which is great to pair with fish, meats or to enjoy as a side. In recent years, cauliflower has made a comeback and has become one of the most versatile ingredients in the kitchen. It’s used in so many unique ways now, including riced as a healthy carb alternative, as a pizza crust or as a component of healthy stir fries. 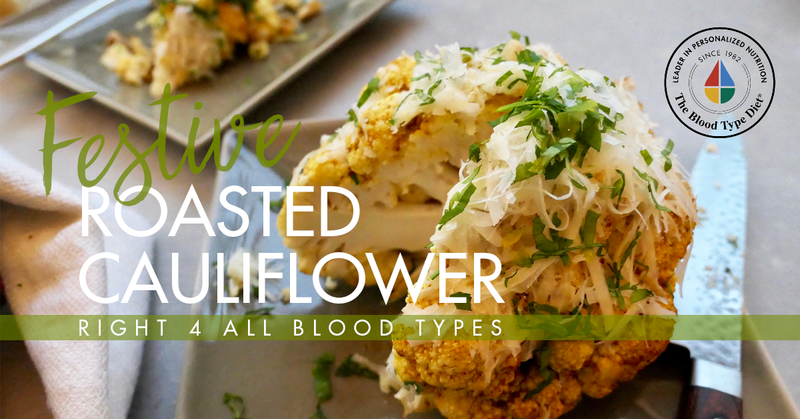 This roasted cauliflower is a simple and delicious preparation that is as easy to prepare, as it is festive and hearty for the fall season. Wash the cauliflower, trim its leaves and remove the stalk. In a bowl, mix the extra-virgin olive oil with the spices. Brush the marinade over the cauliflower. Place the seasoned cauliflower in a casserole dish, sprinkle with salt and cover. Bake for 30 minutes. Test the cauliflower with a toothpick; it must be very tender and cooked through. Top with the desired toppings. If using cheese, sprinkle grated cheese generously over the cauliflower and broil for a couple of minutes until melted and golden.